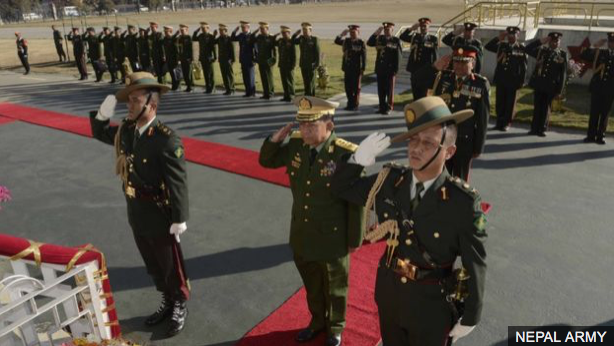 Nepali Times | The Brief » Blog Archive » Why is the Burmese general here? The Burmese Army Chief who is accused of masterminding ethnic cleansing on his country’s Rohingya people is in Kathmandu on a four-day visit. The Nepal Army said he was here to study Nepal’s peace process, especially the demobilisation of the rebel fighters. Several human rights activists have criticised the visit of someone accused to gross human rights violations, and said the timing was not right. However, Nepali officials maintain that the Rohingya issue is Burma’s internal affair and had nothing to do with Gen Min Aung Hlaing’s visit to Nepal. Some 600,000 Rohingyas have fled to Bangladesh since August, which the United Nations has characterised as a ‘textbook case of ethnic cleansing’. This has brought widespread international criticism of Burma’s democracy warrior and Nobel Peace Prize winner, Aung San Suu Kyi. “The visit exposes Nepal’s lack of adherence to its responsibility to uphold international law, and shows support for gross violations of human rights,” said activist Govinda Bandi. Other activists say Nepal should have been much more sensitive to the fact that it has just been voted into the UN Human Rights Council. Former Nepal Army General Balananda Sharma who has worked on the Burmese peace process agreed that Gen Haing’s visit should not be seen from the perspective of Burma’s internal affairs. Gen Sharma was in charge of the secretariat managing the integration of Maoist fighters into the Nepal Army and added: “They also need to end their 70-year-old insurgencies, it is good he is here to hear about our experience in the peace process.” Of the insurgent groups in Burma, the government has a peace agreement with eight and efforts are on to bring 13 others into a truce. This is not the first time that senior Burmese officials and political leaders have visited Nepal to meet the prime minister and politicians. Nepali activists say officials here should alert Burmese military personnel about the need to investigate war crimes. But others also say that the process of Burma’s efforts to ensure transitional justice should not be derailed by its Rohingya crisis.